The main lobbying organization for community newspapers in the United States recorded a big loss in the 2017-18 fiscal year, just as it was fighting an ultimately winning battle against tariffs that spiked the cost of newsprint. The papers' second biggest cost is printing. In its annual report to members, the National Newspaper Association reported operating revenues of $867,436 and total operating expenses of $1,033,803, for a loss of $166,366. "Membership was hit hard by a decrease in revenue of $150,137," NNA reported. 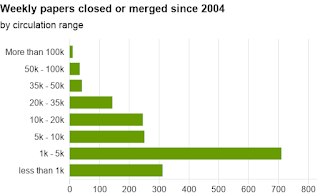 "Since 2007, membership revenue has decreased 10 out of the past 12 years. In 2007, membership revenue was $963,447, dropping to this year’s level of $579,724." The report did not reveal the number of members. NNA said, "We all know the challenges that are facing the industry, and this year’s dramatic decrease is in direct response to the newsprint tariff challenges. 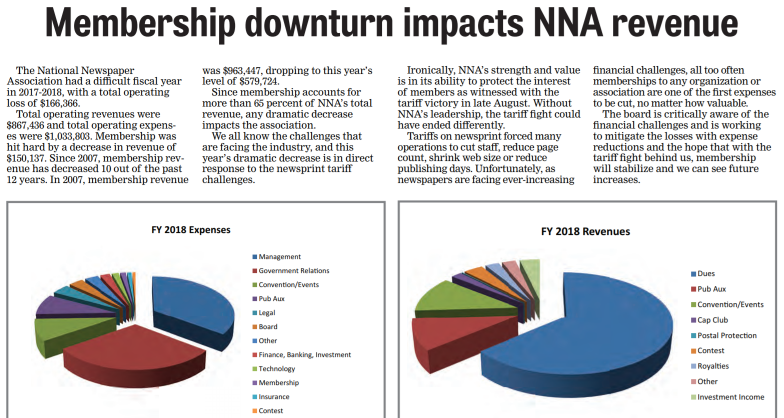 Ironically, NNA’s strength and value is in its ability to protect the interest of members as witnessed with the tariff victory in late August. Without NNA’s leadership, the tariff fight could have ended differently. Tariffs on newsprint forced many operations to cut staff, reduce page count, shrink web size or reduce publishing days. Unfortunately, as newspapers are facing ever-increasing financial challenges, all too often memberships to any organization or association are one of the first expenses to be cut, no matter how valuable. The board is critically aware of the financial challenges and is working to mitigate the losses with expense reductions and the hope that with the tariff fight behind us, membership will stabilize and we can see future increases." The NNA's report is troubling. The long-term membership decline reflects a significant decrease in the number of community newspapers in the last 15 years, mostly among small papers, especially those not based in county seats. The decline in the past year was even more troubling, but also ironic, coming amid one of the greatest battles NNA ever fought, and one it won. I do not believe the association overreaches when it says the tariff fight could have ended differently without its leadership. I do believe that NNA clearly made a difference, mobilizing editors and publishers in a lobbying campaign that looked very much like an uphill battle when it began. I also believe that the tariffs were the greatest single existential threat to rural journalism and community newspapers in their history, greater than the advents of radio, television, the digital revolution and social media. That is not to discount the latter two threats, to which many community newspapers have not adequately adapted. But as they deal with those challenges and diminished resources, I hope they realize that their businesses may have been saved by NNA, and that they should support it with their membership dues. I do, as an associate member. No other organization fights such battles at the national level for rural and community newspapers and the journalism they provide. The tariff fights shows that these issues go beyond the often complex dealings with the U.S. Postal Service, which is increasingly used by community dailies for delivery. NNA is largely a weeklies' organization, but dailies need to support it, too. It stands for newspapers, journalism and their essential roles in democracy. All papers should be members. Of the Farm Bill, which is now being reconciled, he says: “A farm bill sincerely intending to help rural communities might begin by proposing a program of production controls and price supports for every product of farming and forestry,” modeled on the tobacco program that his father helped start. Farmers can better control production and crop prices, while ensuring their financial wellbeing, he advises, by forming cooperatives like the Burley Tobacco Growers Cooperative Association that his father, John Berry Sr., founded in 1941. The Appalachian Regional Commission has announced $26.5 million in awards meant to diversify and expand the economy in Appalachian communities hurt by the decline of the coal industry. The awards come from the Partnerships for Opportunity and Workforce and Economic Revitalization Initiative. "These 35 awards are projected to create or retain over 5,400 jobs and leverage more than $193 million in private investment into 59 of the region’s coal-impacted counties by supporting workforce training and education in manufacturing, technology, healthcare, and other industry sectors," The Lane Report reports. "They also invest in infrastructure enhancements to continue developing the region’s tourism, entrepreneurial and agriculture sectors, as well as increase access to community-based capital, including impact-investing funds, venture capital and angel investment streams." Virginia Community Capital in Christiansburg, Va., will receive $2.5 million for Impact Appalachia: A Market-Making Fund for Central Appalachia. The project aims to fill funding gaps in Central Appalachia's economy and support business development. Coalfield Development Corporation in Wayne, W.Va., will receive $2.03 million for its Social Enterprise and Economic Diversification-Leveraging Investment for Transformation project, which seeks to remove barriers to participating in the workforce. West Virginia Products Cooperative, Inc. in Princeton, W.Va. will receive $1.8 million to boost the timber industry in Appalachia. The Alabama Community College System will receive $1.75 million for its Alabama STRONG (Skills Training to support Real Opportunities for New job Growth) project, which seeks to increase awareness about current and future job opportunities in the advanced manufacturing sector in 10 coal-impacted counties in Alabama. The Volunteer Energy Cooperative in Decatur, Tenn., will receive $1.5 million for the Internet of Things Innovation Ecosystem Project, which works to increase fiber optic broadband buildout and improve its management. The Marshall University Research Corporation in Huntington, W.Va., will receive $1.49 million for its Creating Opportunities for Recovery Employment program, which aims to develop a regional system to provide treatment and recovery, job training, and job placement services to people suffering from the decline of coal and the opioid epidemic. The Natural Capital Investment Fund in Shepherdstown, W.Va., will receive $1.37 million for its Downtown Appalachia Redevelopment Initiative, which seeks to create healthy downtown commercial districts in coal-impacted West Virginia towns. The Appalachian Wildlife Foundation, Inc., in Corbin, Ky., will receive $1.3 million to install a wastewater treatment facility for the Appalachian Wildlife Center. The center is being developed on 19 miles of reclaimed mine land as a tourist attraction that will eventually feature the nation's largest elk restoration and viewing site. The Southwestern North Carolina Planning and Economic Development Commission will receive $1.25 million for physical improvements to the Western North Carolina Farmers Market. "The infrastructure improvements will provide immediate benefits to 64 market-dependent businesses, will attract new clients and consumers to the market, and will providespace to incubate value-added businesses," ARC reports. The Southern Alleghenies Planning and Development Commission in Altoona, Penn., will receive $1.22 million to expand the Alleghenies Entrepreneurial Ecosystem, commonly called Startup Alleghenies. The program helps entrepreneurs create and expand new businesses, which will bring new jobs to the area. Innovation Works, Inc., in Pittsburgh, Penn., will receive $1.03 million for the Western Pennsylvania Small Business Services for Coal-Impacted Communities program. The program seeks to revitalize coal-impacted communities in western Pennsylvania by helping people find jobs or start businesses. It also supports existing businesses. The Center for Rural Development in Somerset, Ky., will receive a $1 million grant to support its Community Oriented Access to Learning program. The program will help unemployed and underemployed residents in 14 counties in southeastern Kentucky to obtain job training and education. Escaping hurricanes (and other natural disasters like wildfires or tornadoes) is particularly difficult for the rural poor. Some don’t have driver’s licenses, like Gene Bearden of the Florida panhandle town of Panacea. A sheriff’s deputy wrote him a pass allowing him to drive while evacuating Hurricane Michael, but he ended up weathering the storm one town away in his parked truck, Patricia Mazzei reports for The New York Times. Others just don’t have the money or a car. “Some people are getting out of town, but that’s not an option for me. I have no money, no job, no connections,” Tony Clower, a Kinston, North Carolina, resident who is homeless, told the Asheville Citizen-Times before Hurricane Florence. And for the poor, who often don’t have savings, the losses suffered can be harder to recover from. Jack Cattledge, who lives in the same RV park in Panacea, said he estimated Michael had caused about $1,000 in damage to his camper, and said he had likely lost $300-$500 in groceries in his freezer, Mazzei reports. Hurricanes are doubly hurtful for farmers, many of whom can ill afford to lose profits. Harvests have been ruined by the one-two whammy of Florence and Michael, and farmers must also deal with clean-up costs. Running a rural county government is hard. Don't believe it? Test your mettle at iCivics, a website meant to increase civic participation and help students understand how government works. Retired Supreme Court Justice Sandra Day O'Connor founded it in 2009, partnering with developers to create 19 games that let players do everything from argue a Supreme Court case to helping an immigrant become a citizen. The site has lessons plans for teachers. "For people with an interest in small towns and rural areas, the obvious first stop is the game Counties that Work, created with support from the National Association of Counties. In this game, players take on the role of a county elected official, responding to a range of constituent requests and community needs. There are decisions large and small to make, constituents to please, and the everyday business of keeping a county government humming and in the black," Bryce Oates writes for The Daily Yonder. Journalists may note with interest the site's newest game, Newsfeed Defenders, which launched Oct. 3. It helps students tell the difference between reliable and unreliable news items on social media. It was developed in partnership with the Annenberg Public Policy Center, which runs FactCheck.org. The U.S. Forest Service has proposed changes to the greater sage grouse's conservation plans that would make it easier for oil and gas drillers to develop land in its habitats in Colorado, Idaho, Nevada, Wyoming and Utah. "A sage grouse coordinator with the Forest Service said the goal is to protect habitat while also making more land available to recreation, mining and grazing," Cooper McKim reports for Wyoming Public Radio. But Michael Saul with the Center for Biological Diversity told McKim that the plan will put the bird "on the road to extinction." The plan would remove sagebrush focal areas, which were recognized in 2015 as habitat critical to the bird's survival, Scott Streater reports for Energy & Environment News. It also says that states and the federal government no longer have to cooperate before approving certain kinds of development. The Forest Service proposal dovetails with the Bureau of Land Management's recent plan to allow oil and gas companies to develop on sage-grouse habitat.The two agencies' authority over the same issue may seem confusing, but essentially, the Forest Service can dictate an endangered species' conservation plan (for instance, it can decide which lands will be designated as its habitat). 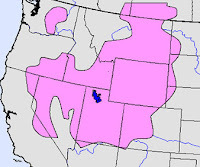 The BLM's plans cover how oil and gas drillers can develop in that designated habitat. The draft is subject to a 90-day public comment period that runs through Jan. 3. Rural teachers can feel isolated from resources that their urban colleagues have, so a group of educators in California decided to do something about it. Last spring about 100 teachers, superintendents, principals and students from all over the state met near Sacramento to launch a network to connect rural schools. The California Rural Ed Network, which launched online Oct. 1, aims to help rural schools "join forces to attract new resources, share expertise and focus attention of policy makers to schools outside urban and suburban California — many of them underfunded and serving a preponderance of low-income students," Lee Romney reports for EdSource. In California and the U.S., rural youth make up about a fifth of all students and face disproportionate poverty, isolation, and inequalities that are exacerbated "by the lack of attention" to their unique needs, according to the National School Boards Association Center for Public Education. The network was the brainchild of Susan Hukkanen, a former assistant superintendent in Northern California's Butte County. She was leading a team to bring a "multi-tiered system of support" to all rural schools in the state, to help all students with academic, social and emotional needs. "In her conversations with colleagues in other rural districts, common concerns kept popping up: They felt overlooked, under-resourced, overwhelmed by the needs of their students and families and entirely absent from statewide policy conversations," Romney reports. CREN tries to address those problems with a searchable online resource bank with more information and ideas on common issues such as drug and alcohol abuse, parent engagement, staff recruitment, dealing with childhood trauma, and more. Facebook, which provides a platform for journalism but may also blur the definition of the craft, has been working on a video series paying tribute to local investigative journalism. Facebook partnered with al.com's social media brand, Reckon, to produce the eight-minute videos. In each video, director and host Ian Hoppe introduces a case of corruption, shows how a local journalist investigated and reported it, then talks about what happened next. "So far, 'Chasing Corruption' has brought in more than 800,000 views for the stories of a sneaky sheriff in Kentucky, a vote-suppressing governor in Alabama and a dangerously negligent and well-paid housing official in Illinois," Kristen Hare reports for the Poynter Institute. "The series uses video, animation and a dash of humor to show that local investigative reporting comes from newsrooms of all sizes and from journalists of all backgrounds. 'Chasing Corruption' doesn’t just show corrupt elected officials, either, but how systematic corruption impacts whole communities." Kelly Scott, Alabama Media Group's vice president of content, told Hare that "In some ways, these stories are a love letter to investigative journalism . . . We are focused on the jobs that investigative journalists do throughout the country and the service they provide and what that means to America at this point in our country." AMG is the parent company for al.com, the Newhouse Newspapers brand for its dailies in Birmingham, Montgomery and Huntsville. Facebook donated $1,000 to Investigative Reporters and Editors and has encouraged viewers to donate too, Hare reports. The rural mountains of eastern West Virginia are one of the largest undeveloped tracts in the eastern United States, Zach Montague notes for The New York Times as he reports on adventure tourism in the area: "While persistent poverty still weighs down many corners of the region, travelers coming to experience its natural gems have, in recent years, fueled a modest resurgence in the towns that lie near them. Joining an old guard of native residents, an influx of outsiders has helped resuscitate communities that were all but burned out after the near-collapse of the coal and logging industries in the earlier part of the 20th century." One example is Davis, a community of 660 on the edge of the Monongahela National Forest. The town's "upbeat cafes" and "quirky boutiques" lend the town an energetic vibe, Montague reports. The town's major draw for tourists is that it's a convenient way to access trails for mountain bikers, cross country skiers and hikers. Savvy locals run outdoors stores and festivals to cater to these tourists. Three miles away, the town of Thomas, pop. 600, also attracts tourists. Thomas is a bit artsier, boasting art galleries, coffee houses, breweries, and folk music festivals. And a bit larger at 3,000 people, nearby Fayetteville capitalizes on its proximity to the New River Gorge to bring in white-water rafting and kayaking enthusiasts. Though the towns seem remote, they're only a few hours away from some of the most populous parts of the U.S. "For outdoor enthusiasts in this radius looking for a weekend trip, the hilly terrain around the towns is some of the best in the area," Montague writes. 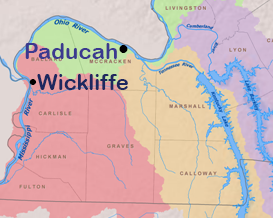 In an effort to reduce populations of invasive Asian carp in Western Kentucky, the state has awarded a first-of-its-kind contract to a company that will buy carp from fishermen, process it and sell it, David Snow reports for The Paducah Sun. Gov. Matt Bevin announced the contract with Kentucky Fish Center in Wickliffe this week. The company is owned and operated by nearby fish processing outfit Two Rivers Fisheries. "Asian carp caught in Kentucky will be sold by the center in daily auctions open to any interested buyers," Snow reports. "The Kentucky Department of Fish and Wildlife Resources will oversee the auctions." Two Rivers is the biggest Asian-carp exporter in the U.S. and has processed almost 8 million pounds since 2013, according to Vice President of Development Lining He. "There is a lot of potential," He told Snow. "Right now, we are using it as frozen fish, the basic product. Next, we are working on ground meat. From there, you can do hamburgers, sausage, sandwiches, that type of thing . . . Over the next couple of years, we will have a full operation covering the frozen fish, processing and reprocessed products as well as the organic fertilizer." But the company will need a reliable supply of carp to do that. That's where enterprising locals come in: Kentucky Fish Center will buy fish from fishermen, offering $5,000 or more a month, a sign-up bonus and a free Ford F-150 pickup truck bonus for those who bring in a million pounds of Asian carp in one year. Workers will also be needed for the processing plant. Anglers will have to catch a lot more Asian carp to keep them from dominating waters in Western Kentucky. State Tourism Secretary Don Parkinson told Snow, "We need to support the creation of a much bigger fish industry here. We're getting about 2 million pounds a year now; we need 5 million in two years, and in five years, we're going to have 20 million. If you don't start getting fish out on that scale, it's going to overrun these lakes." Want to start a locally owned newspaper? The Poynter Institute's News University will host a webinar on Oct. 15 showing how to do it with tips from people who have already done it. American Free Trade Agreement, Humeyra Pamuk reports for Reuters. USDA announced in August that the first $6 billion would include cash payments to farmers of soybeans, sorghum, corn, wheat, cotton, dairy and hogs. Regarding the second $6 billion installment, Agriculture Secretary Sonny Perdue told Reuters the department will be "recalculating along as we go" because the new agreement might lessen the financial pain felt by some farmers. Pamuk notes, "American farmers have yet to see the full benefit of the new accord as an ongoing dispute over steel and aluminum tariffs mean they still face retaliatory measures when trading with Canada and Mexico. That agreement also does not address the harm as a result of the trade war." Perdue told Reuters that the steel and aluminum tariffs were "instrumental" in pressuring Canada to negotiate the deal, but now that it has been signed, the tariffs' purpose has been served and he believes the three countries should return to a no-tariff policy on steel and aluminum. As expected, President Trump announced Tuesday the details of his plan to lift the federal ban on summer sales of high-ethanol gasoline blends, which will benefit corn-growing states. High-ethanol blends have as much as 15 percent ethanol; gasoline typically has about 10 percent. "His pitch was aimed squarely at farm-state voters who are at risk of breaking from Republicans over a trade agenda that has triggered retaliatory tariffs on U.S. agricultural exports," writes Siobahn Hughes of The Wall Street Journal. "Trump’s ethanol proposal still has to go through a rulemaking process and runs the risk of legal challenges. Most notably his proposal faces fierce opposition from the oil industry, which has complained about the costs of increased ethanol use. But even if Mr. Trump’s ethanol push fails, it still could motivate midterm voters in farm states." Matthew Daly reports for The Associated Press, "The long-expected announcement is something of a reward to Iowa Sen. Chuck Grassley, who as Senate Judiciary Committee chairman led a contentious but successful fight to confirm Brett Kavanaugh to the Supreme Court. The veteran Republican lawmaker is the Senate’s leading ethanol proponent and sharply criticized the Trump administration’s proposed rollback in ethanol volumes earlier this year." Grassley and other Republican senators announced a tentative agreement to allow year-round E15 sales in May, but the Environmental Protection Agency didn't propose a rule change. Now EPA is expected to soon publish the change, along with restrictions on trading biofuel credits under the Renewable Fuel Standard that dictates how much ethanol and other renewable fuels refiners must blend into gasoline each year. "The EPA currently bans the high-ethanol blend, called E15, during the summer because of concerns that it contributes to smog on hot days, a claim ethanol industry advocates say is unfounded," Daly notes. "A bipartisan group of lawmakers, many from oil-producing states, sent Trump a letter last week opposing expanded sales of high-ethanol gas," saying it wouldn't protect refinery jobs and could damage consumers' vehicles. "Westmoreland Coal Co., the country’s sixth-largest coal-mining business with 19 mines in six states and Canada, announced Tuesday that it has filed for Chapter 11 bankruptcy and entered into a restructuring agreement with lenders in the face of $1.4 billion in debt," Judith Kohler reports for The Denver Post. "Westmoreland is among several coal companies that have filed for bankruptcy protection or continue to struggle as concerns about greenhouse-gas emissions from coal-fueled power plants have grown, and natural gas and renewable energy have become increasingly more economical than coal." A Westmoreland spokesperson said the company will refinance an existing $110 million bridge loan to support its operations during the restructuring, and doesn't anticipate any layoffs of its nearly 3,000 employees. The company has mines in Canada and in Montana, North Dakota, Ohio, Texas, Wyoming, and New Mexico. It is based in Colorado. "The filing for voluntary Chapter 11 protection in U.S. Bankruptcy Court in Houston lists the Bureau of Indian Affairs and the Pension Benefit Guaranty Corp. among its 50 largest creditors with unsecured claims," Kohler reports. "Westmoreland has leases with the Crow Indian Tribe in Montana. The company reported about $770 million in assets." "States that rely on the shrinking supply of water from the Colorado River have released drafts of a set of agreements intended to prevent reservoirs on the river from falling to perilously low levels," Ian James reports for the Arizona Republic. "The documents, which were released Tuesday, lay out a framework for cuts in water deliveries to prop up the levels of the river’s two biggest reservoirs, Lake Mead and Lake Powell." Under the Colorado River Compact, first established in 1922, use of the river's waters is divided among seven states (Arizona, California, Colorado, New Mexico, Nevada, Utah and Wyoming) and Mexico. When the compact was renegotiated last year, the U.S. and Mexico extended a previous agreement that both countries will cut back on water use if the river runs low. This proposal fleshes out how those cutbacks will be implemented. State water managers began meeting in July to hammer out the details of the drought plan. Arizona is still working on in-negotiations about how its water cutbacks will be spread among cities, farms and tribes, but federal officials hope to have an overall deal finished by mid-December, when the Colorado River Water Users Association's will have its annual conference, James reports. Once the Lower Colorado Basin states sign the proposed agreement, Mexico will be obliged to create its own plan to help increase water levels in Lake Mead, which is now 38 percent full. The plans may need to be put to use soon. "Federal officials have said the region will narrowly escape a shortage in 2019 but that a shortage may be declared in 2020," James reports. And Ted Kowalski of the Walton Family Foundation's Colorado River Initiative, noted that "2018 has been one of the river’s driest years on record, and combined storage levels in Lake Powell and Lake Mead are at their lowest point in roughly 50 years." Most small towns want to lure more businesses, but some residents in Schodack, N.Y, are trying to keep one out. Online retail giant Amazon wants to build a million-square-foot fulfillment center just outside the town of 13,000. "The warehouse is set to stand three stories tall in the mostly rural area and boast more than 1,000 parking spaces for an estimated 800 employees. It will have spaces for massive delivery trucks on one side and be built on land totaling 116 acres previously used for farming," Michael Sainato reports for The Guardian. After the town board approved the plan in July, an association of homeowners near the site the Birchwood Association, filed suit to try to halt the project. The lawsuit seeks an appeal against the town board's decision and asks that an environmental impact study of the project be required. "They argue the local economy does not suit such a large development – and nor does it need the promised jobs. 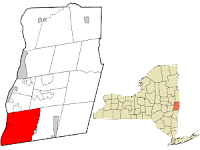 Schodack primarily thrives on small local businesses and the county Schodack is located in, Rensselaer County, already has a relatively low unemployment rate, currently at 3.9 percent, and a median income over $61,000," Sainato reports. The Birchwood Association also cited concerns about traffic, property values, emergency services and groundwater contamination. "We all have paid residential tax rates in this neighborhood. They come in with corporations, give them huge tax benefits, and screw everyone else who lives here and the water supply," Marci Brunner, a leader of the association, told Sainato. "We are trying to protect the environment and the quality of life, not just for us but everyone in Schodack and the local areas that will be impacted by this." "Arming teachers to protect against school shootings is likely less effective than other safety measures, including laws that hold gun owners responsible when minors get a hold of negligently stored firearms," says a research review written for the public-policy research arm of the State University of New York, reports Route Fifty. The notion of arming teachers has gained popularity, especially in rural areas where gun ownership is higher and many schools fear they're too far away for law enforcement to reach in time. But there is little if any research to support the idea. "While no data exist to support the assertion that the presence of armed individuals has been or would be successful in stopping school shootings, there is evidence that indicates such a policy would fail to meet its intended goals," Jaclyn Schildkraut, a criminal-justice professor at SUNY Oswego, writes for the the Rockefeller Institute of Government. On the belief that an average civilian would be less accurate with a firearm than a law-enforcement officer, Schildkraut examined research that studied officers' accuracy rates in firearm discharges. A two-decade study found that officers' bullets hit their targets around 20 percent of the time, a figure that remained steady despite improvements in weaponry and training. Another study of New York City officers involved in active-shooter incidents found that the officers' accuracy was 30 percent when no one was shooting back at them, and 18 percent when someone was. A person's ability to accurately fire a gun during a stressful situation may be hampered by the body's physical response to stress, even after training, Schildkraut writes: "Civilians receive considerably less firearms training in general as compared to law enforcement officers and such instruction does not typically include stress-inducing simulations. Thus, it is conceivable that their accuracy rate during a shooting would be considerably lower, even if they were to receive more extensive training." Also, if civilians have guns during an active-shooter situation, police responders have to spend extra time trying to figure out who is the shooter and who is an armed bystander, Schildkraut notes. Research shows that civilians have had greater success in ending active-shooter situations without using a firearm, Schildkraut writes: "In sum, the evidence suggests that arming teachers (and other civilians) not only could fail to deter a school shooter, it potentially could make these events more lethal." Though Congress will likely legalize its cultivation nationwide in the new Farm Bill, it "will remain a tightly regulated crop facing plenty of regulatory and legal challenges," Sophie Quinton reports for Stateline. "As the more than 30 states that operate hemp pilot programs have discovered, it’s not easy to oversee a plant that’s used to make everything from car parts to hand cream," and which, except for one thing, "is identical to marijuana, which the federal government still classifies as a dangerous drug." Tim Gordon, president of the Colorado Hemp Industries Association, told Quinton that it could take one or two years for the federal government to create regulations for hemp. For instance, the government must create a national standard for how to test hemp for the psychoactive chemical tetrahydrocannabinol. Under federal law, hemp cannot have more than a 0.3 percent concentration of THC. "State agriculture commissioners are now banding together to come up with a common standard. A working group convened by the National Association of State Departments of Agriculture is expected to start meeting next month," Quinton reports. The question of THC content can be tricky. Some farmers have an incentive to grow hemp that has as much THC as legally allowed, since increasing THC increases the level of cannabidiol, a compound used for its medicinal properties. CBD is part of the reason for increasing pressure to legalize hemp; sales are expected to top $646 million within the next four years, according to Hemp Business Journal. But CBD is at the center of a regulatory tangle: "The U.S. Food and Drug Administration has maintained that CBD oil cannot be marketed as a dietary supplement, and has been going after companies for making outlandish health claims," Quinton reports. "Laws and regulations that define the hemp extract, who can use it and who can sell it, differ from state to state." The Farm Bill would classify CBD as an agricultural product, so states may need to tweak their laws to conform. Where's the money? From whom does your representative or candidate take campaign money? How do they spend it? What percentage of money does a candidate take from political action committees versus individual donors? The PACs with the most money are often funded by corporations and interest groups. "A reliance on PACs, versus individual donors, can tell you something about a candidate’s institutional support versus grassroots support," Giwa reports. "A higher percentage of funds from PACs means a candidate’s donor money comes mostly in fairly large checks, as opposed to donations from individuals. A higher percentage of individual donations, on the other hand, is a sign of grassroots enthusiasm about the campaign." What do the numbers mean? Campaign donations are the lifeblood of a political campaign; they can't air ads or pay staffers without it. The more competitive races tend to attract more money; a race listed as a Toss-Up by the Cook Political Report will likely be well-funded on both sides. Money tends to win races, too; with some notable exceptions, the candidate who brings in more money is more likely to win. But Giwa notes, "Money is important, but it’s not the only factor." What about the issues? Candidates address issues on their websites and in press releases, but some candidates' claims can be misleading, so look at nonpartisan fact checkers like FactCheck.org and Politifact. Another good source is the League of Women Voters' Vote411.org project. The League reached out to every state and local candidate for office with a set of identical questions and recorded the answers in a database. How high-speed internet came to a remote area of Tenn. Seven years ago, the internet speed in Highland, a town in rural Scott County, Tennessee, was 1.5 megabits per second, but today the county boasts a fiber network with some of the fastest speeds in the state. The improvement in Highland and other rural areas of Tennessee is a testament to how community leaders can use grants most effectively to improve infrastructure. 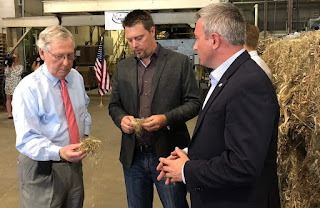 "The recent upgrades that include 2,700 miles of fiber installation stem from a $67 million federal grant awarded to Highland Telephone Cooperative in 2010, part of the 2009 American Recovery and Reinvestment Act," Jamie McGee reports for The Tennessean. "Twenty-five percent of the grant was a loan that will cost the cooperative $17 million over a 25-year period." About 60 percent of the county has adopted the high-speed internet and almost all businesses have signed up for it. Running fiber-optic cable to every house would have been prohibitively expensive; the county has only three homes per square mile. And with 18 percent unemployment, it needed the jobs high-speed internet could bring. Highland CEO and General Manager Mark Patterson said, "We would never have had the funding to do this without the grant. . . . It’s just too expensive for a company this size." Tennessee Telecommunications Association Executive Director Levoy Knowles told McGee that small telephone co-ops and other companies have been building out "hundreds of thousands of miles" of fiber a year in recent years, but says state tax credits would help them do more. Educating more residents about what high-speed internet can do in their lives would increase adoption rates and make the investment more feasible for providers, he said. Medicare Advantage plans offer convenience and affordability for consumers, but also pitfalls -- and they can be problematic for rural health-care providers. The Congressional Budget Office found in January that "not only do Medicare Advantage plans generally pay 3 percent less than traditional Medicare . . . but they often negotiate reimbursement rates even lower for rural hospitals," Susannah Luthi reported for Modern Healthcare. "Medicare law limits the payments hospitals can collect out-of-network, giving Medicare Advantage plans the upper hand with rural hospitals as they negotiate reimbursement rates. In effect, 'Medicare Advantage insurers can exclude hospitals from their networks and pay them Medicare FFS prices,' the CBO analysis said, referring to fee-for-service rates." Holy Cross Hospital in Taos found itself at a disadvantage. Luthi illustrated that with an example from Taos, N.M.: Holy Cross Hospital converted to critical-access status in July 2010, so it had "to change its billing setup with all the insurers in its network." UnitedHealthcare demanded a new contract saying that it "would no longer pay for its beneficiaries to stay in Holy Cross beyond four days." The hospital gave in. "Given our cash situation and our desire to get our past claims processed, we felt forced, that we had to accept those terms," CEO Bill Patten told Luthi. "Patten's story echoes a narrative of low reimbursements and uneven leverage between carrier and hospital from rural hospitals across the country," she writes. "The scarcity of providers in rural communities also makes those markets less appealing for Medicare Advantage plans based on their overall financial targets," Luthi notes. But plenty of rural Americans who are about to go on Medicare get pitches from Advantage companies offering very low or zero premiums. The latest column from Trudy Lieberman of Rural Health News Service describes the pitfalls of basing decisions on premiums. "The first basic choice is whether to select traditional Medicare, and buy a supplement to fill in what Medicare doesn’t pay, or to select a Medicare Advantage plan," Lieberman writes. "Increasingly, though, some people may not have a choice. More employers who fund part of their retirees’ health insurance are automatically enrolling their workers about to retire in Medicare Advantage plans, and those workers may not understand what they are getting." The Tracy Press in California alerted readers to the 78th annual observance and said, "As the theme indicates, this is a critical time for the American institution of journalism because the national political rhetoric now includes allegations that newspapers are little more than purveyors of false information bent on enacting a radical hidden agenda. This is not the first time these tactics have been used to identify the press as an enemy in an effort to devalue information that is published about someone or some group. That tactic at the national level hurts all of us, because it even makes readers here in Tracy and Mountain House question the sources of our information and the integrity of our reporting." Publisher Rod Baker of the Ledger Independent in Maysville, Ky., did what newspapers ought to do more often: remind readers of their purpose, polices and practices. "Our mission is to deliver local news and information that’s important to you and our community in an unbiased and truthful manner," Baker wrote. "Our desire is to inform, inspire and educate our readers each and every day through our print and online outlets. We are the only local news outlet that extensively covers our local government entities both city and county, local community events, publishes public notices to keep you informed, offers comprehensive listings of local deaths in both print and online, follows and provides information on local sporting events, and the list can go on and on." In the Cedar County Republican in Missouri, freelancer Jim Hamilton noted a recent salute to retiring publisher Dave Berry that drew U.S. Sen. Roy Blunt, Gov. Mike Parson "and a host of other notables, . . . Many of the accolades heaped on Dave were associated with his role as a community leader, as well they should have; but I hope folks were paying attention when Sen. Blunt, former Sterling Media owner Jim Sterling and others noted his virtues as a newspaperman. . . . Dave was an old-school journalist — a reporter relentless in digging out the truth, an editor unafraid to hold elected officials’ feet to the fire, a newsman willing to go nose-to-nose with public figures seeking to suppress embarrassing arrests or court actions." Newspaper Week editorials need to be aimed not so much at readers, but at non-readers, through social media -- reminding these potential readers that journalism practices a discipline of verification, something that is entirely absent on social media. We shouldn't take for granted that people can tell real journalism when they see it; journalists have not been that good at defending our brand, and that's why the theme of this year's Newspaper Week is a good one. It's worth repeating. President Trump plans to announce tomorrow that he will allow high-ethanol gasoline to be sold year-round, a move that could shore up Republican prospects in the upper Midwest, where his trade policies have been politically problematic. "Trump is tentatively scheduled to commit to the policy change on E15 fuel that would expand the market for corn-based ethanol during a campaign event near Council Bluffs, Iowa," Jennifer A. Dlouhy and Mario Parker report for Bloomberg News. "At the same time, the administration may announce reforms of the market for biofuel compliance credits that are traded by Wall Street banks as a financial commodity." The announcement is set to come at a campaign event for Rep. David Young, who has pressed Trump for the change, and would precede a Trump rally in Council Bluffs. "The shift would effectively waive E15 from federal vapor-pressure requirements that block its sale from June 1 to Sept. 15 in areas where smog is a problem," Bloomberg reports. "At the same time, the Trump administration would pursue reforms in an opaque $2.5 billion market in biofuel compliance credits that are used by refiners to satisfy U.S. blending quotas. Among the reforms being considered: position limits capping the number of so-called renewable identification numbers that can be held by traders, a shift that could push some of them out of the market." A group of West Virginians formed a group called the Ohio Valley Jobs Alliance in 2015, saying they were a "voice for local jobs," but have taken legal action to block three proposed power plants, to be fueled by natural gas, that would bring jobs to West Virginians. The group is at least partially funded by Murray Energy Corp., one of the nation's largest coal producers, the Charleston Gazette-Mail's Ken Ward Jr. reports for ProPublica's Local Reporting Network. CEO Robert Murray was a major donor to President Trump and gave him a pro-coal wish list. Construction has not begun on any of the three plants, partly because of legal challenges. In all three cases, OJVA lawyers have challenged key permits required for construction. "In pursuing their cases, the lawyers paid, at least in part, by Murray Energy have relied on the same kinds of government regulations that Robert Murray has railed against," Ward reports. "In the Moundsville plant case, those lawyers challenged a permit partly because it allowed an increase in carbon-dioxide emissions that cause global warming. Murray has said global warming is a 'hoax'." Murray Energy said in a statement that OJVA is a "grassroots organization that seeks to preserve coal jobs in the Ohio Valley" and that, other than "certain legal fees," Murray has not provided any financial support to the organization. "Testimony in the power plant cases before both agencies doesn’t reveal details about Murray Energy’s funding for the OVJA lawyers, and current financial records for the alliance aren’t publicly available," Ward reports. Backers of the Moundsville Power project in Marshall County say the job would provide 500 jobs during each of the three years of its construction and 30 permanent jobs once construction is complete. "Like the Moundsville plant, the facilities proposed for Harrison and Brooke counties would provide hundreds of construction jobs for several years and then about 30 permanent positions. All told, the three plants would cost more than $2 billion to build," Ward reports. Anne Blankenship, director of the West Virginia Oil and Natural Gas Association, wrote in an op-ed that the plants would bring even more permanent jobs in the form of "well servicers, compressor station operators, pipeline inspectors, air permit compliance field specialists" and more. Here's another installment of a series we will run weekly until Election Day, in which we list some of the most relevant items from FactCheck.org and other nonpartisan fact checkers. We encourage you to subscribe to their alerts, which you can do here, and republish their findings, which FactCheck lets anyone do for free with credit to them. In a speech announcing her decision to vote for Judge Brett Kavanaugh's confirmation to the U.S. Supreme Court, Sen. Susan Collins, R-Maine, said Kavanaugh and Merrick Garland "voted the same way in 93 percent of cases they heard together" on the District of Columbia federal appeals court. In comparing Kavanaugh's votes with Garland, whom President Obama nominated to the Supreme Court, Collins attempted to show that Kavanaugh was "more of a centrist" than critics say. But her statement is misleading: "A high rate of unanimity is not unusual among appellate court judges or indicative of how one might rule if elevated to the Supreme Court, as the nonpartisan Congressional Research Service wrote in a recent report on Kavanaugh and his potential impact on the high court," Eugene Kiely reports for FactCheck. FactCheck notes that such statistics are "frequently misused" and that it dealt with a similar claim in 2017, when Trump nominated Neil Gorsuch to the court. The nonpartisan CRS explained then and now that there is a high rate of unanimity on appeals courts because appellate judges are "bound by Supreme Court and circuit precedent," and "not normally in a position to espouse freely their views on particular legal issues in the context of their judicial opinions." Also, the reports said, though the Supreme Court has almost complete discretion over the cases it hears, federal appeals courts are required to hear many cases, including routine cases in which judges are likely to agree. The CRS notes that, although Kavanaugh has agreed with Garland in most cases, "Kavanaugh had the highest rate of issuing separate opinions, either concurring or dissenting, (15.53 percent) and the highest rate of issuing dissenting opinions (8.58 percent) than any of the six judges on the D.C. Circuit Court from May 31, 2006, to July 9, 2018. Garland was at the bottom of that list with a separate opinion rate of 1.8 percent and a dissenting opinion rate of less than 1 percent." 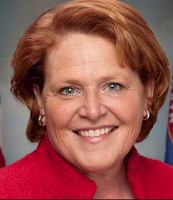 Sen. Heidi Heitkamp, D-N.D., claims in a new campaign ad that her Republican opponent, Rep. Kevin Cramer, gave himself a $23,000 raise as an official on the Public Service Commission, raising his salary to over $93,650. But Politifact rated that claim False: "Cramer did get raises totalling that amount. But the ad completely distorts Cramer’s hand in securing the pay increase," Manuela Tobias reports. The three commissioners are elected to six-year terms. 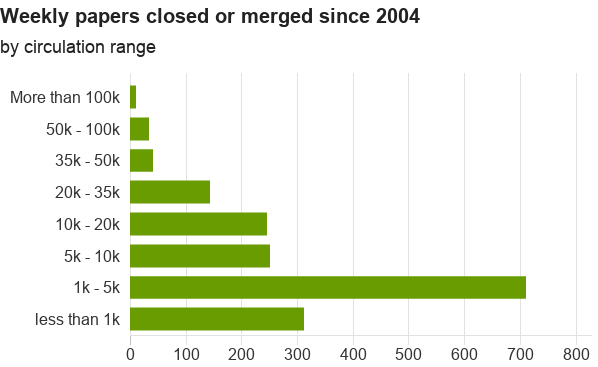 Cramer was ne in 2003-12. Their salaries are determined by the governor and the state Office of Management and Budget, then approved by the legislature. Tobias reports, "The OMB proposed and received across-the-board salary hikes for elected officials every year between 2005 and 2012. . . .Staff at the Public Service Commission and at the OMB said they could not recall an instance in which they had requested salary bumps for commissioners." Politifact has marshaled a group of state-by-state correspondents to feed it ads and statements that deserve checking, and is open to contributions from others, in case you see an ad that is difficult for you to check out. A screenshot of the USDA's Community Assessment Tool. Click here to view the interactive version. The U.S. Department of Agriculture has launched an interactive tool to help rural community leaders create strategies to address the opioid epidemic. 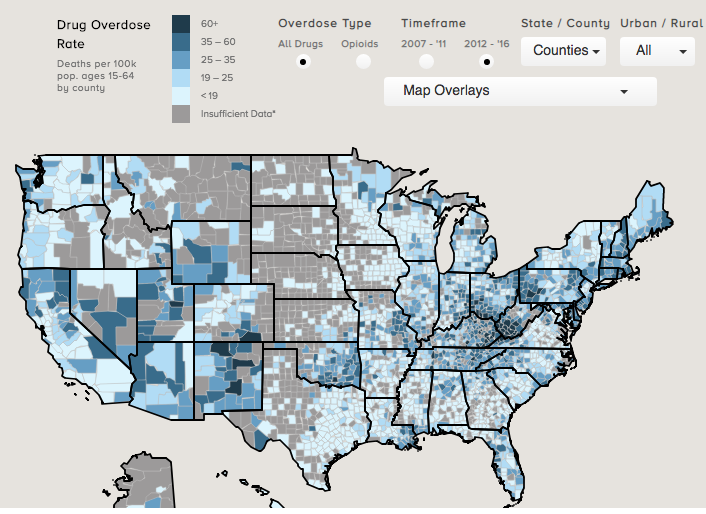 "The Community Assessment Tool enables users to overlay substance misuse data against socioeconomic, census and other public information," the High Plains Journal reports. "This data will help leaders, researchers and policymakers assess what actions will be most effective in addressing the opioid crisis at the local level." The tool is free to use and available to the public. 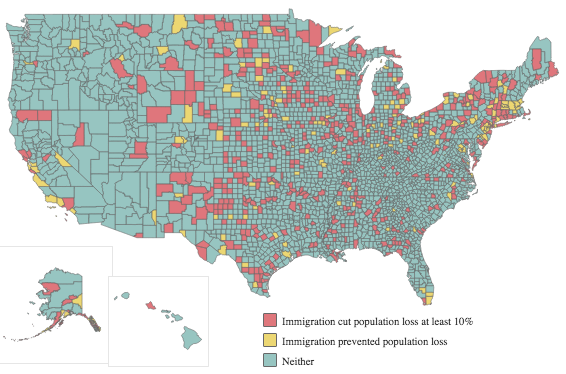 It was created by the Rural Development division of the USDA in partnership with the Walsh Center for Rural Health Analysis, which is part of the non-partisan NORC (formerly the National Opinion Research Center) at the University of Chicago. Fentanyl has been a growing factor in the opioid crisis in recent years: drug dealers sometimes lace their product with the inexpensive drug to stretch their supply (and profits) further, but fentanyl is so potent that it's easy to use too much and cause overdoses. Fentanyl is now involved in at least half of all opioid deaths, but a $1 test strip for the potent drug may help drug users from overdosing. "When dipped into a drug, the strip reveals—with the presence, or absence, of a red line—whether that drug contains fentanyl. Researchers suspect that if more drug users had access to the strips, they could test their drugs and use less, or possibly not use them at all," Olga Khazan reports for The Atlantic. Researchers studied 125 heroin users in Greensboro, N.C., to see if distributing the test strips through a needle-exchange program would reduce overdoses. "Through an online survey, 81 percent of the drug users reported using the strips, and 63 percent got a positive result for fentanyl," Khazan reports. "Those who saw the positive result were five times as likely to change the way they used a drug in an effort to avoid overdosing. They might have used less than usual, for example, or snorted it instead of injecting it, which results in less of the drug being absorbed into the bloodstream." A few cities have started providing the strips along with clean needles at exchanges. Like clean needles, naloxone distribution, and safe shoot-up spots, the test strips are meant not to prevent drug addiction but to make it safer for addicts. Local laws that prohibit drug paraphernalia could prevent the test strips from being used more widely though. Some communities have rewritten such laws to exclude clean needles, but the laws might still apply to test strips.